Eventually, we expose the services offered by the PHP-powered APIs we build to users. Unlike a decade ago when we could count potential client applications on one hand, today the potential client can be anything. But for most people-facing applications, it still means HTML output with images and CSS. 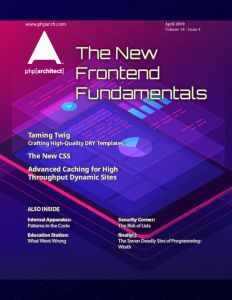 In this issue, we have articles to help keep your CSS know-how up to date, your twig components re-usable, and your dynamic front-end code quick. We spend a great deal of time organizing our code, but our frontend templates don’t always receive the same care and attention. Using the approach outlined in this article, we can build a library of reusable components that make templating easy, more efficient, and fun! Believe it or not, CSS is awesome. No, wait! Come back! It’s a new day for our styles on the web. There have been so many advancements in the past five years to what we can accomplish with CSS that you probably haven’t had a chance to keep up. User tolerance for long website and application load times is extremely low. While PHP 7 produces considerably more efficient code than its predecessors, caching is vital for being able to meet performance expectations in high traffic environments. This article presents PHP-native caching options so developers can meet user expectations without needing to over-complicate the web stack. The very first thing you need to do when something goes wrong is to get a good handle on the situation and find out what’s wrong. Many users first instincts are to get frustrated and say, “This is broken!” and expect you to figure it out. While there can be lots of places to look, narrowing down the possible causes can help greatly. The OWASP Top Ten is required reading for anyone in software development, regardless of whether or not your role focuses on security. It’s a useful guide to get you started thinking from a strong security mindset. Be careful, however, to avoid thinking the list is exhaustive or provides comprehensive security for your application or system. The PHP compiler source code includes many patterns that can be frustrating and intimidating, because they are so different from typical PHP code, until we understand the structure and context. C’s preprocessor has a significant role in these unfamiliar patterns. We look at several of these patterns in the compiler’s PHP Array implementation. For our final installment of this series, it’s time for us to address Wrath in how it relates to programming. Wrath, commonly known as Anger, in the middle ages was considered the opposite of Love. Those who were wrathful had spurned love, choosing to act in rage instead. I saved it for last in this series because it manifests in many different ways in life and code.